Nespresso, the European leader in the ultra-competitive portioned coffee market, was constantly inundated by a growing list of sponsored links leaching off its brand name in search results pages. Selecting these sponsored links would divert users away from the intended listing, being Nespresso. These sponsored links often appear in the right column of the search results page. Furthermore, in many countries they even precede the organic rankings. These listings may have emanated from competitors, fake dealers or even authorized retailers to create harmful brand confusion with the goal of redirecting many potential consumers. How can a company protect itself from this kind of commercial hijacking and keep control over its brand name on the Internet? In general, the principal search engines sell brand keywords without worrying about the legitimacy of the purchasing company or the probability of violation of intellectual property rights. Considered a type of “brand hijacking”, this practice of purchasing brand names as keywords has been generally accepted as one of the many inevitable Internet pitfalls. In September 2005, a procedure was established to forbid the purchase of the keyword “nespresso” by companies other than Nespresso itself, invoking intellectual property clauses and recent jurisprudence. This in turn allowed them to regain online control of their brand name and to put an end to unfair competition. Intellectual property rules differ from country to country, leading Nespresso to launch many legal proceedings. These focused proceedings included 11 countries where Nespresso brand keyword campaigns started. 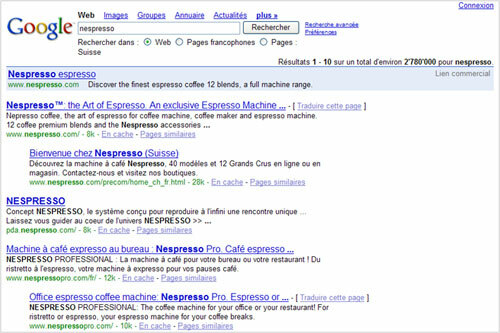 Once the illegitimate competition was eliminated, Nespresso’s keyword purchasing campaigns quickly started generating more clicks. 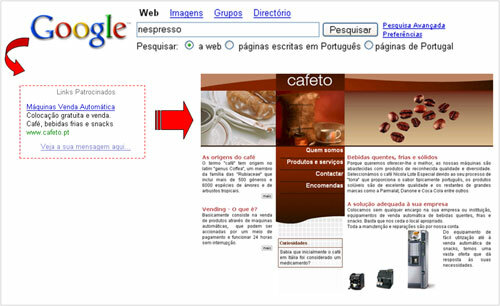 Moreover, they were optimized in order for users specific search intentions to land them directly on the most appropriate page on www.nespresso.com. Today, by typing the word “nespresso” on Google, for example, you will notice that there are no longer any sponsored links, apart from Nespresso and its authorized retailers. Discover BrandSweeper, our exclusive solution to combat the misuse of your brand in the search engines.